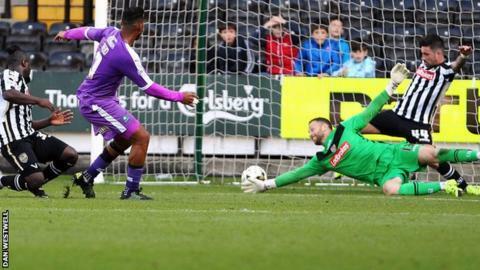 Two goals from Reuben Reid sent Plymouth back to the top of League Two with victory at Notts County. The striker fired Argyle into the lead when he turned and shot right-footed on the edge of the area following keeper Luke McCormick's long clearance. Graham Burke hit a post and Alan Smith had a shot tipped over as County searched for a first-half equaliser. Reid made the points safe late on when he slotted home inside the area after Scott Loach had saved his initial shot. Derek Adams' side go three points clear at the top after being temporarily replaced by Portsmouth at the summit on Saturday. Match ends, Notts County 0, Plymouth Argyle 2. Second Half ends, Notts County 0, Plymouth Argyle 2. Attempt saved. Reuben Reid (Plymouth Argyle) left footed shot from the centre of the box is saved in the bottom left corner. Stanley Aborah (Notts County) wins a free kick on the left wing. Josh Simpson (Plymouth Argyle) wins a free kick on the left wing. Attempt saved. Izale McLeod (Notts County) header from the centre of the box is saved in the centre of the goal. Goal! Notts County 0, Plymouth Argyle 2. Reuben Reid (Plymouth Argyle) right footed shot from the centre of the box to the bottom left corner. Assisted by Jake Jervis. Ryan Brunt (Plymouth Argyle) wins a free kick in the attacking half. Corner, Notts County. Conceded by Gary Sawyer. Corner, Plymouth Argyle. Conceded by Stanley Aborah. Substitution, Notts County. Julian Jenner replaces Adam Campbell. Substitution, Notts County. Kyle De Silva replaces Graham Burke. Reuben Reid (Plymouth Argyle) has gone down, but that's a dive. Substitution, Plymouth Argyle. Ryan Brunt replaces Craig Tanner. Alan Smith (Notts County) wins a free kick on the left wing. Corner, Plymouth Argyle. Conceded by Alan Sheehan. Attempt missed. Graham Burke (Notts County) left footed shot from the left side of the box is close, but misses to the left. Attempt missed. Jake Jervis (Plymouth Argyle) left footed shot from the centre of the box is close, but misses to the left. Hand ball by Reuben Reid (Plymouth Argyle). Attempt missed. Graham Carey (Plymouth Argyle) right footed shot from the centre of the box misses to the right. Attempt missed. Izale McLeod (Notts County) left footed shot from the right side of the box is high and wide to the left. Attempt missed. Jon Stead (Notts County) right footed shot from the right side of the box misses to the left. Izale McLeod (Notts County) wins a free kick on the right wing. Substitution, Notts County. Jon Stead replaces Elliott Hewitt. Substitution, Plymouth Argyle. Graham Carey replaces Hiram Boateng. Izale McLeod (Notts County) is shown the yellow card. Izale McLeod (Notts County) has gone down, but that's a dive. Hand ball by Hiram Boateng (Plymouth Argyle). Attempt missed. Craig Tanner (Plymouth Argyle) left footed shot from outside the box is just a bit too high from a direct free kick.